A natural calamity can be a warning but a supernatural invasion can only be described as a Woe. The First four trumpet blasts of Revelation represent ecological warnings to mankind (discussed in my previous post), but the two that follow are of an entirely different nature and are called ‘woes’. The trumpets of Revelation Chapter Eight affect humanity indirectly though the environment whereas the woes of Chapter Nine effect mankind in a very direct way. The graphic presentations in this chapter are among the most bizarre in the book and have given rise to some weird interpretations. I have read books in which the strange locust like creatures depicted here are really Apache attack helicopters and the horses that follow them are Saracen tanks! But how are we supposed to interpret what these strange ‘beasties’ represent? Actually, it’s not that difficult to work out the general meaning of these scenes if you remember the interpretive principle of Revelation 1:20 – the truth is conveyed through symbols and is not meant to be reduced to concrete objects, dates, and numbers. 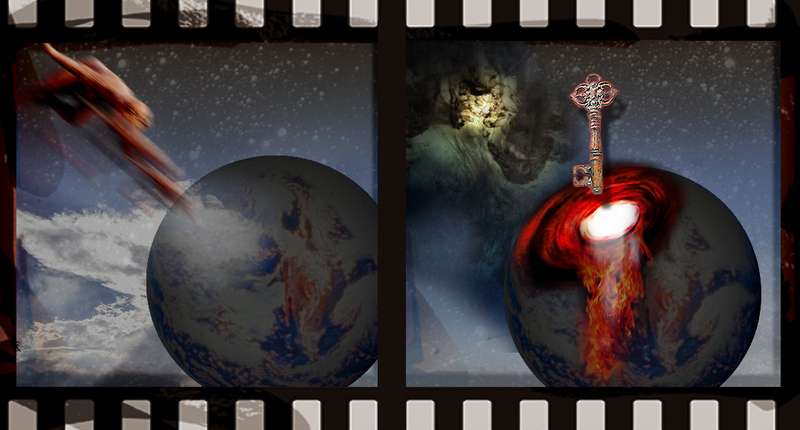 The scene opens with a ‘star that had fallen from the sky to the earth’ (Revelation 9:1). According to the interpretive key ‘stars’ equal angels, so this depicts an angel that had fallen from heaven to earth. Jesus used very similar words when He exclaimed, “I saw Satan fall like lightning from heaven” (Luke 10:18-19). This fallen angel is given the key to the Abyss, the bottomless pit. Once again, we can look to Jesus to understand what this represents. Luke:8 26-33 records how Jesus confronted the hoard of demons possessing a man living in caves in the region of Gadara. Verse 31 records that they ‘begged him repeatedly not to order them to go into the Abyss’. So, the Abyss is the name assigned to the state where demons are confined and so the terrifying beings pouring out of the abyss therefore represent demons. All of this is supported by the added detail that ‘they had as king over them the angel of the Abyss, whose name in Hebrew is Abaddon, and in Greek, Apollyon’ (Revelation 9:11). i.e. the devil. So, we can easily determine that demons constitute the first Woe, but you will need a further clue in order to understand their ‘sting in the tail’: ‘They were told not to harm the grass of the earth or any plant or tree, but only those people who did not have the seal of God on their foreheads’ (Revelation 9:4). Their target is unsaved humanity; those who’s spirits and souls are not sealed by the Holy Spirit and protected by the truth. They rob such people of life while not physically killing them. At this point you will need to extend some grace to me for I need to make a bold statement that I will only be able to substantiate when we get to Chapter Thirteen. The demon locusts are a vivid symbolic depiction of HUMANISM in all its various forms. Now this statement is probably a bit of a shock to the system. The dictionary definition on humanism is ‘a system of thought which is based on the values, characteristics, and behaviour which are believed to be best in human beings, rather than on any supernatural authority’. This is indeed how a spiritually unregenerate person would view humanism, because a worldly understanding is that humans are essentially good and that the supernatural does not exist. But, if we take the source of humanism as the rebellion of Adam and Eve in Eden, then both of these presumptions prove false – man is not inherently good and supernatural evil is both real and responsible. I understand humanism to comprise science, medicine, philosophy, economics, technology, military power, politics, and hedonism. There is an obviously dark side to each of these, such as war, addiction, greed and so on, but why would I label the ostensibly noble pursuits of the human race as a ‘woe’? Well I don’t. What I class as a catastrophic woe is the pursuit of these things outside of the Word of God, the authority of Scripture, and the Lordship of Jesus Christ. I therefore define humanism as the godless pursuit and manipulation of the categories of human endeavour I have listed. Defined in this way humanism is nothing less than the enthronement of self and the denial of the lordship of Jesus Christ… and that is indeed a demonic woe that has plagued mankind for millennia and will ultimately deliver a death blow to godless humanity. The second woe is just as destructive… but I will write about that next week. This is a real eye opener but I am still blinking so I need to read it again and again. Thanks Chris. I am so impressed that with all your Christian knowledge and experience you are still prepared to consider and grapple with different approaches and interpretations. Bless you Cynthia. This comes at a good time, as I will be doing the SATS Doctrine of Revelations course next year as a part of my Bth course. Thanks for following the posts Stephen. The SATS course ‘Doctrine of Revelation’ is not a commentary on the book of Revelation but covers General and Specific Revelation i.e the Bible and The Lord Jesus Christ. I am sure you will enjoy it. I wrote the original course although it has been revised since then. Hi Chris, I like the way you describe Humanism. We need to put our trust in Jesus and live the way He teaches us through the Holy Spirit and the word, which is not always the easy way out of difficult circumstances. Impatience can lead to the humanistic woe and then I lose my peace. Thank God for His mercy and grace. I want to be like the Man of Galalee humble and true.